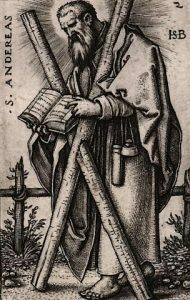 Saint Andrew Catholic community draws its identity and strength from the Eucharist as it grows in the faith through sacred worship, living the joy of the Gospel, and lifelong catechesis. The parish family, guided by the Holy Spirit and within the communion of the Catholic Church, serves as the light of Christ by practicing compassion, serving the poor and needy, and continuing the tradition of Catholic education in its parochial school. Saint Andrew Parish shares God’s love and mercy across inter-generational and multicultural lines, celebrates the diversity and gifts of its members, and always seeks first the Kingdom of God. Saint Andrew Parish was founded on May 29, 1969. It was established to serve the growing Catholic community for the six-year-old city of Coral Springs, Parkland, and a portion of Broward County. The founding Pastor was Reverend Patrick E. Farrell, a tall man with a heavy Irish brogue, and a warm and welcoming presence. The first Mass was celebrated at 8:15am at the Coral Ridge Administration Building, now the Coral Springs City Hall. The 10:00am Mass was held at private homes throughout the city. By late 1970, Father Farrell secured the property for a permanent church through the Mellon Foundation, and ground breaking occurred on February 6, 1972, officiated by Reverend Monsignor John J. O’Looney, Pastor Emeritus of Saint Anthony Church in Fort Lauderdale. The original church building was erected and dedicated on September 23, 1972. “The Parish in those early years may have been small, but it shared a sense of loving community,” a parishioner stated. In the spring of 1976, Father Farrell convened a meeting of all parents who might be interested in a parochial elementary school. Permission was granted from the Archdiocese to build the school. Ground was broken on July 4, 1976, the day of the Nation’s Bicentennial. The new school was duly blessed by Archbishop Edward McCarthy, and classes began in the new building on December 8, 1976. Another wing to the school was added in the summer of 1978, which consisted of four classrooms, a library, a cafeteria, Religious Education officers and dressing rooms for the Physical Education classes. In 1980, a new Pastor, Reverend Brendan Grogan, arrived at Saint Andrew. Under his guidance, a new church was built and opened in 1982. The original Church was transitioned into the Parish Hall, and the cafeteria services for the school were moved to this building. Reverend James Quinn became Saint Andrew Catholic Church Pastor in 1986. In 1990, Saint Andrew students were the first to earn computers for the school from Publix Supermarkets’ Apples for Students Program. Despite its small size of 320 students, SACC families turned in over $1 million in receipts to be the first to earn that dollar amount in computers. As enrollment for the school increased, ideas for a larger, state of the art facility appeared on the planning board. In 1994, the Parish had raised half of its three million dollar goal to enlarge the school and double the enrollment. Construction of the new school began under Father Quinn. In 1996, Reverend Arthur Dennison became Pastor of Saint Andrew. Under this tutelage, the new school was completed and opened in October of 1996. July 2002 welcomed Saint Andrew’s new Pastor; Reverend Father George Puthusseril. In his first years at Saint Andrew, the Men’s Club started, and hosted the First Annual Thanksgiving Dinner which remains an occasion for parishioners to work together in service. In November 2005, Cardinal Luis Aponte-Martinez, former Archbishop of San Juan, and member of the Conclave that elected John Paul I, John Paul II and Benedict XVI, celebrated Sunday Mass at Saint Andrew for the Feast of Our Lady of Divine Providence, patroness of Puerto Rico. Monsignor Puthusseril left our parish a lasting legacy with the construction of the Zimmermann Memorial Adoration Chapel. The Chapel was dedicated by Archbishop John Clement Favalora on September 30, 2009. In July of 2012, Saint Andrew welcomed its current Pastor, former secretary to Archbishop Favalora, Monsignor Michael A. Souckar. The Parish community looks forward to many flourishing years under Monsignor Souckar’s guidance.